Daniel Foster | Wed, June 6, 2007 | Misc. Logos doesn’t do a lot of radio advertising, but sometimes we have occasion to dabble in this area. Of course, it’s always a challenge to convey a very visual product via an aural-only medium. We’ve pretty well established the fact that when people see Logos Bible Software, they “get it” and are eager to own a copy…but when they hear about it (especially when limited to a 60-second spot) the response is not so automatic. We don’t have a big budget to go out and hire a flashy advertising firm to create ads, sowhen we do a radio ad it’s usually written in-house. Since we’ve got a couple buildings full of smart, creative people, the Logos marketing department will solicit ideas from the whole office and run with the best idea that comes in. The two radio spots linked below recently ran on our local Christian radio station, Praise 106.5. You can download and listen to them as MP3s. I edited out the special URL given for the radio campaign (can’t spoil our sales source tracking with a massive influx of orders from the blog! )so you may notice an abrupt ending or jump. Daniel Foster | Tue, June 5, 2007 | Misc. Biblioblogs.com is a list ofblogs on biblical topics, maintained byJim West and Brandon Wason. Besides being a great resource to discover blogs on topics that may interest you,it alsofeatures a different biblioblogger every month and posts an interview with that person. Why do I mention it now? BecauseJune’s Featured Blogger is none other than our very own Rick Brannan, who writes for the Logos Blog, Ricoblog and PastoralEpistles.com. Check out Rick’s interview to learn the origins of the name Ricoblog, what Space Invaders and a TRS-80 have to do with Bible software, and how Say’s Law relates to the future of blogging. Oh, and while you’re reading about Rick, stop by Ricoblog and congratulate him on his brand new baby. She’s a cutie! The good people over at InterVarsity Press have ramped up their blogosphere presence with a couple of cool, new,behind-the-scenes blogs. Welcome! In Andy Unedited, IVP editorial director Andrew T. Le Peau writes about publishing from the inside.One recent post discussed what goes into craftinga good (or bad) book title. Something I’ve always wondered about myself. Addenda & Errata is written by the IVP Academic editorial team.A couple of recent postsshared jokes that weary authors inserted into indices and dictionaries. Ever heard of the theologian Franz Bibfeldt? I, for one, look forward to learning more about our print publishing brethren from these blogs. I’ll also take the opportunity to remind you that our very own publisher relation guy Bill Nienhuis is back in the blogging saddle at Original Expression and recently shared some insightful thoughts on the battle between authors and publishers over print-on-demand rights. And who said book publishing isn’t fun…? Daniel Foster | Wed, May 30, 2007 | Misc. Guest blogger Scott Lindsey is back in the office after five weeks on the Bible Study Bus. View more road trip photos at Flickr or readScott’s first and second posts from the trip. Bob Pritchett, our fearless leader, and family flew into Dallas on Tuesday evening to take the keys to the Bible Study Bus and continue our Bible study campaign across America! I can’t believe my leg of the trip is done… WHEW, that was a lot of driving and work. The Lindsey Crew drove almost 5,000 miles in the last 5 weeks. But it sure has been a privilege to introduce people to the best Bible study technology on the planet! We had some great BBQ and an even better event Tuesday night in Fort Worth at Christ Chapel Bible Church. Attending Tuesday night’s event was Mike Atwell, our new Field Rep for the Dallas/Ft. Worth area. 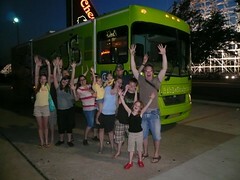 Wednesday was a day to celebrate… the first installment of the Bible Study Bus Road Trip is complete! So, we went to Six Flags over Texas. Thanks to Sean Fields – our resident graphic artist – and his loud-and-proud Bible Study Bus design, it’s impossible to forget where you park the thing. You should have seen the bus in the massive Six Flags parking lot… thousands of people all day walked by mouthing the words Bible-Study-Bus. We invited the Dossey family up from Austin to enjoy the day with us. Alex and Nicole both used to work at Logos and have remained dear friends. It was great seeing them again! It was truly a blessing to travel across this great nation for the last 5 weeks and meet so many wonderful churches and show the Body of Christ how Logos can greatly impact personal Bible study. I pray the fruit of our labor brings glory to the Lord and creates a hunger and thirst for His word. 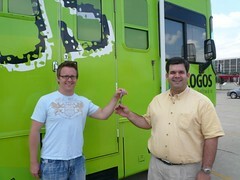 Well, onward Logos Bible Study Bus! The Road Trip continues through August so we hope to see you at one of the events. Daniel Foster | Tue, May 29, 2007 | Misc. Mac users can download the new and improved Bible Widget from www.LogosBibleWidget.comor Apple.com. Thebiggest update is that thenew widget adds the ESV Bibleso you can instantly navigate to a verse in either the English Standard Version or King James Version Bible. Using the widget is simple: Type a Bible reference to jump to that verse. Click the forward or back arrow to jump to the next/previous verse; click the double arrows to jump to verse 1 of the next/previous chapter. You can copy/paste text from the verse window into another application. To switch Bible versions, just flip the widget over. As promised, I’m back for one final post on this whole “most important people in the Bible” topic. The first two posts in the series are here and here. Today we’ll take a quick look at a visualization of the top 50 women of the Bible, as determined by Logos information architect Sean Boisen’s calculations. This data is also available at Many Eyes for anyone to manipulate and try out new information visualizations. Here’s the scatterplot; click the thumbnail for a full view. This time, dot size is the final “importance” scoreusing all the weights and factors calculated. The x-axis is the total number of mentions in the Bible. Bigger dot = more important; further right = more mentions. One of the most interesting things we see here is the name Zeruiah with a pretty big dot and fifth place in terms of mentions. I don’t know about you, but I don’t recall ever hearing a Bible story about Zeruiah. My girls (ages 3 and 4 1/2) and I are on our second time through the cartoon Picture Bible and we haven’t encountered any such person. Who is this mystery woman? With the help of the Biblical People Addintool within Logos Bible Software 3, it’s pretty easy to find out. I fired up the tool and typed “zeruiah” to generate the following graph. Turns out Zeruiah was King David’s sister. But ifshe’s the fifth most-frequently mentionedwoman in Scripture and is closely related to a majorcharacterwithin the biblical narrative why wouldn’t I know anything about what she did or said? The answer to this question is also provided by the Biblical People tool. I can hover over or click each of the Bible references to see every mention of Zeruiah in brief context. Or better yet, type Zeruiah’s name into Bible Speed Search and get all the verses on one screen. It may be that Zeruiah points up another opportunity for improving Sean’s “importance” weighting factors. Can somebody who appears in Scripture by name only, with no speaking or acting role, benumberedamong the mostimportant? I’d ask Sean for comment but he’s presenting a case study at the Semantic Technology Conference in San Jose so I’ll just have to wait until he gets back. You’ve been wanting to do it for some time…why not make it a goal to learn Hebrew this summer? This brand new Logos book is due toshipat the end of the month, so now is your last chance to take advantage of the prepub discount and get this for less than $20. I had the pleasure to meet Mark Futato when he was here in Bellingham giving atalk on Psalmsas part of the Logos Lecture Series. It was a fantastic talk,and Mark would be a great teacher of Hebrew whether in person or via this grammar. Logos user George Somsel warned, “I can see it putting all Hebrew instructors out of work since it’s so simple to teach yourself.” Look to your tenure, Hebrew profs! This one is the big enchilada, complete with audio recordings and a workbook. These resources begin with the alphabet…or you might say the Aleph-bet (aleph is the first letter of the Hebrew alphabet, get it? )…and over the course of thirty lessons provides enough information and practice to enable you, with the aid of a Hebrew-English dictionary, to understand most biblical texts. We just put together a brief video demo so now you can get a look at what the First Hebrew Primer package is all about. Wouldn’t it be great if you got to the end of summer and could look back on not only a bunch of great barbecues, ball games and days at the beach…but also take with you a new knowledge of and appreciation for the Bible that Jesus used? Learning Hebrew would provide a lifetime of rewards and there’s no better time to begin than now! Daniel Foster | Tue, May 22, 2007 | Misc. Earlier this month, we blogged about the process used toquantify theThe Most Important Person in the Bible by computing factors such as frequency of mentions and the dispersion of those mentions across biblical books and chapters. As you might suppose, Jesus Christ is the most important person in the Bible. But what I findinteresting is how the Bible characters fall into rather distinct first, second and third rate clusters when we use Sean Boisen’salgorithm. These three clusters really jump out when the data is loaded into Many Eyes,IBM’sonline visualization engine. Click the screenshot above to see a full-size static image that I enhanced with name labels…or click here to play with the live visualization at Many Eyes (Java required). The remaining 36 characters…starting with Levi, Benjamin, Hezekiah and ending with Jehoshaphat, Uzziah and Adam. If you wanted to study the various people in the Bible using a top-down list, it wouldn’t hurt to begin with Jesus, David and Moses. Jacob might be a little higher up the list than I would think warranted. But the second clusterseems pretty solid, with Abraham, Joseph, Paul and Peter definitely looming large in the pages ofScripture. A few biblical figures I didn’t expect would be buriedso far down in Cluster 3: Noah and Adam, those staples of bedtime Bible stories and flannelgraphs. Plus prophets with whole books named after them such as Jeremiah and Isaiah. Of course, these are the top 50 Bible peopleout of 2,987…so we’re not talking about obscurity for any of them. The X-axis is the overall “importance ranking” and the dot size is the number of mentions. So Sean’s weighting is evident in those places where you see a smaller dot like Abraham promoted far above a larger dot like Saul. Ranking the Bible names strictly by number of mentions would put Saul above Abraham, so we’re clearly getting a more nuanced view here. The upshot of all this? We’re not solving the Bible Code or anything…and not trying to. But Ifind it very cool that anaverage joe like me can play around with these data and visualizations without knowing a lick of programming. I made this visualization just by selecting a visualization style and choosing which data to put on which axes. Once the dataset iscomplete (thanks, Sean!) we’ll be able to do all kinds of additional cool things not possible today…and be able to do it using Logos Bible Software! I’ve said it before and I’m sure I’ll say it again…Logos users are a very clever bunch. OK Figured it out. Select a hebrew text like the BHS and all you get is the table. Woo hoo. I’m not sure whether this little trick should be considereda hack orfeature (no doubt my friends in development would take credit for it as the latter) but it does seem to work and strikes me as the kind of thing that could be useful so I’m sharing it with you. To try it out, open Logos 3 and click Tools | Bible Comparison | Parallel Passages and Harmonies. For Source, choose Synopsis of the Four Gospels (Aland) if you have it. If not, don’t worry—it works with other data sets, too. For Bible version, choose BHS or ESV OT Rev. Int (the latter is in more packages). Daniel Foster | Thu, May 17, 2007 | Misc. Today’s guest blogger is Rob Haskell, who works in the Spanish department at Logos. It’s been fun to find out through my work with Logos that missions is a growing theme in Latin-American Christianity. This is so much so that we have been able to create a collection of 40 books on missions from a Hispanic perspective called Biblioteca Digital de la Misión (Digital Library for the Mission). According to COMIBAM, an umbrella organization for missions from Latin America, there are almost 10,000 Latin missionaries around the globe – many of them in the US! Andthat figure does not take into account the number of “non-professional” missionaries who emigrate every day from Latin-American countries to all parts of the globe, taking with them the good news about Jesus. Last month an elderly woman approached our booth ata pastor’s conference in Monterrey, Mexico. She was dark skinned and dressed in a sari so my initial thought was that she was East Indian. As it turned out she was a Mexican woman who was headed to India as a missionary in a month. She was outgoing, energetic and particularly excited because the Lord had just given her a laptop. Of course, the Logos booth was her next stop. Another person had also given her a crisp $100.00 billand after applying all possible discounts she was off with her very own Biblioteca Pastoral – our largest collection of books in Spanish. Now she can take a theological library of 144 books in her own language to the ends of the earth. This committed missionary woman from Monterrey is probably the most striking image I have of the growing Latin-American passion for world missions, but there are many other amazing stories and surprising statistics which all point to a growing movement. It will be interesting to watch it develop and see how Logos can continue to play a role in the Lord’s work around the globe.